NEW BRITAIN, CT- Two Connecticut teams, two members of the NEC, and two former assistants of Jim Calhoun. The Quinnipiac Bobcats trekked up to Central Connecticut State to take on the Blue Devils. The result was an out an out rout that seemed almost certain from the opening moments and was cemented early in the second half. In the middle of a break there were few students around, though plenty of CCSU fans, though QU also had their faithful on hand. In terms of game rituals, Centrals cheerleaders take positions throughout the stands and clap until the Blue Devils score a point, only in this instance they were stuck for minutes on end as Central came up empty. At the 15:38 mark the visitors led 6 to 0 and a time out was called. The onslaught continued to 11 to 0 at 14:40. With 13:34 left, CCSU finally scored a basket to bring the score to 2-11 and freeing the spirit squad from their ritualistic prison. A QU foul gave Central two shots and they made them. The one opportunity the Bobcats gave Central was in fouling often. Another foul gave the blue and white two more shots and those were also made. QU scored to take the lead back to 14-6 but there was at least some semblance of a game now, even if CCSU’s offense consisted largely of free throws. By the 9:36 mark it was 6-18. Quinnipiac was draining 3’s and perimeter shots, and Central was mainly trying to get in close. Another QU foul gave Central a made free throw and a 7-18 score. Quinnipiac attempted to respond and despite three straight shots, none went in and Shemik Thompson grabbed the ball and drove in on the net, and a foul. The score was soon 10-18. 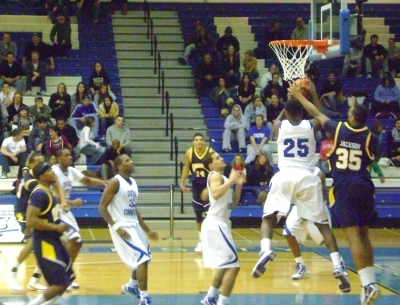 More life came to CCSU when Joe Seymore picked up a steal and in the ensuing passing ended up with an open three which he drained, 13-18. Another time out was called at 7:50. QU had 7 fouls to Central’s 2. QU benefited from a foul and had a 13-19 score. Thompson took the ball up the floor and scored again for a 15-19 game. This would be as close as CCSU would get. to kill momentum and the half ended 21-36. Quinnipiac was shooting 58 percent to Central’s 23. Also critical was QU hitting 4 of 6 three’s. The second half went from bad to worse for Central as QU just plain dominated scoring points quickly including a Feldeine 3 pointer to bring it to 21-42. Central scored, but Jeremy Baker responded for QU driving up and in with a layout and the foul to bring the score to 23-45. The game basically proceeded from there with CCSU making little headway as each team traded points. QU missed more shots in the 2nd, but they didn’t need to make them. Jamee Jackson struck with slam 7 minutes in as well. The score was 30-56 at the 12:20 mark and not long after 30-61. At 7:41 another time out came about, a heckler let lose an angry cry from the stands about CCSU’s performance, but he was smacked down verbally by the PA announcer. QU started subbing for starters, and the numerous fans started hoping each of the rare arrivals on the court would score some points. This finally occurred when Kevin Tarca lined up a three and nailed it earning an eruption from the QU crowd to make the score 45-76, the last points of the game. For QU it was a good day, for CCSU not so much, but the NEC season continues for both teams not long from now. UNH posts 189.725, Rutgers 188.925 in season opener for both teams.